On October 3rd, Dakar elected their new major, Soham El Wardini, the first post-colonial female major in Senegal. This news opened our curiosity and interest in a new topic for our program, E-jáng radio. Senegalese women in Leadership positions. E-jáng is a free radio platform in which students around Thiés-Senegal can practice their English and give their opinions on different topics. Currently, this radio show is run by Alex Taylor, an LPC 18′ alumni and me, Salomé Valdivieso RCN18′ alumni. Alex and I agree that we needed to open our media space to give a voice to those powerful women from Thiés that, like Soham, that are fighting every day for recognition in their jobs and gender equality. 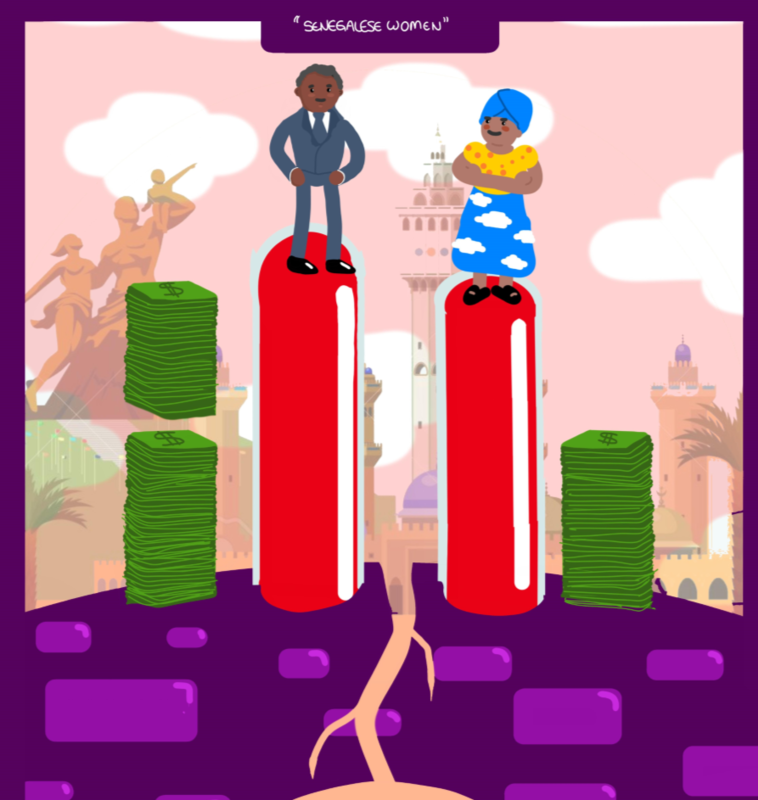 In Senegal, men make on average $142 more than women per month. This is the 15th largest gap in Africa, according to the World Economic Forum. In 2010, Senegal adopted a gender parity law. This law requires political parties to ensure at least half of their candidates (in local and national elections) are female candidates. More than half of Senegal’s population is women -12.5 million. Senegal has a 42.7% of female representation in the legislature. According to the Inter-Parliment Union. Rwanda, Uganda, Seychelles, Namibia, Mozambique, Ethiopia, Angola, Tunisia, South Africa, Burundi, Tanzania, Zimbabwe, Cameroon, Sudan, Algeria, and Senegal have more than 30% women in their legislatures. Which shows that these countries outperform other “more developed countries” like France, which only has 26.2%, or Australia with 26.7%, the USA with 19.4%, and Japan with only 9.5% of women in their legislatures. According to IPU. Even though things are improving in Senegal and other African countries, Senegalese women still face many challenges on a daily basis and in leadership positions. Economic dependency, cultural and social sexism, limited access to education and information, the heavy responsibility of the domestic household all by themselves, harassment, and violence are only a few of the obstacles that women have to go through to improve their lifestyle, they wellness and to be part of the labor workforce. Our guest of the week, Madame Ndiaye, American Institute’s director, had a response to this prompt. For her, women who deal with the household, and the domestic responsibilities are also very important leaders in the community. From an alternative feminist point of view, Madame Ndiaye ensures that domestic labor is the key to the improvement of the Senegalese society. For her, white feminism has undermined the fact that raising a child and be a leader in a house is one of the most important responsibilities of humankind, and this is a work that women are supposed to perform. After this thoughtful response, I agreed with Madame Ndiaye to some extent, and I realize that concepts like “success” and “leader” have been formed around western standards, when in reality, in the other half of the globe, women are re-positioning themselves in their houses and in their communities. Women deal, on a daily basis, with “the reality of hard living conditions, in a country in which over 70% of the population lives below the poverty line”. Those women are the ones, fighting for fair lives for their children, organizing themselves at an economic level in their houses and moving forward to an equal socio-economic status, not only for themselves but also for those around them. At that point of the research, I was wondering myself if we were able to talk the language of intersectional feminism, African feminism, Senegalese feminism. Or the whole program was based on our idea of “leaders”, and in our idea of “successful women”. To be honest, I am not quite sure yet what those concepts and standards mean for me yet. Madame Ndiaye, had a good point: western standard had left behind and blinded the important job that women play in their houses and in their communities. Historically, women roles have been underestimated, and “men jobs” have been considered the future to look for. This new feminist perspective opened my eyes, to see all the effort that women have to do on a daily basis. As an example, I have my host mom and my little sister of 15 years old, whom each day, woke up at 6 AM, to clean the house, cook breakfast, go to school, come back from school, make lunch, clean again, do homework, cook dinner; having a full day with no resting, having no other choice, because no one else in the house will do all of these tasks, but to some extent doing this work, to show love to those that are around them. One of the things, I can rectify, is that women, independently of their religion, their culture, their social context or their country, should be able to decide for themselves. Women all around the world should be able to have the same opportunities to become leaders or to raise children if that is what they prefer. TO HAVE A CHOICE. However, equal opportunities for women are a utopia in many countries around the world, including Senegal. In a country, in which 95% of their population is Muslim, society and culture are strongly influenced by the learnings of the Quoran. Religion has a big impact on what is considered appropriate for gender roles, which to some extent is an obstacle for women to be able to make their own decisions about their roles in their communities and in the labor force. This reality can be testified in their gender wage gap, as well as in the stigma, marginalization, and underestimation of women in all kinds of leadership positions (from women in government, to women working in their houses). Steps like gender parity laws, access to education, fair salaries, violence eradication will open the chance for women to make a choice, and even though these steps are long-term achievable, our job as a generation is to work towards these ideals, step by step, ndanke ndanke, we can eradicate micro-machism, and appreciate the job that women in our houses and around us do. Plato’s “Allegory of the Cave” depicts the journey out of the cave in order to come face to face with our ignorance. The answer to this ‘how’, I’d wager, can be found in his driving sense of purpose. Yes, ‘purpose’. An innocuous word, I know. Just two simple syllables. Yet right now, by which I mean today, aujourd’hui, hoy, vandaag, there is no single more important word in the English language. On 8th March, International Women's Day, students of UWCiM ''rose-filled'' Mostar by marching for ''emancipation and empowerment of womxn regardless of their ethnic background''. Are the complaints about the food quality in Mensa reasonable? The opinion of a teacher. On the 7th of February students from the whole of the Netherlands gathered in the Haag to protest for a sustainable future. More than a hundred students from UWCM joined the protest. Was the decision to object the talk justified?